It's very unusual to see Fungie with his mouth open - unlike Dony and Dusty. In this case the dolphin was very excited after a game of paddle-scratching. The flash photo makes this look scarier than it was. 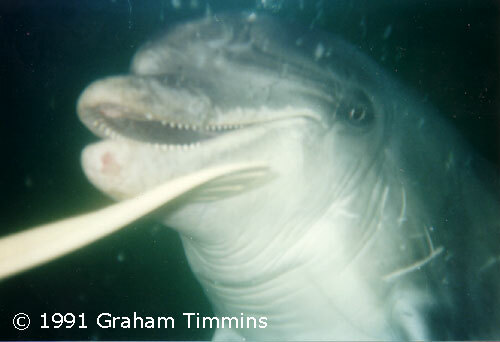 You can see clearly that even in 1991 quite a few of Fungie's front teeth were badly worn or missing. This is an elderly dolphin!